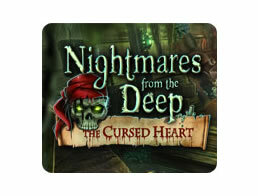 Nightmares from the Deep: The Cursed Heart Game - Download and Play Free Version! Uncover Secrets of the Past in Your Pursuit of an Undead Pirate! Play Through An Engaging Storyline! A forgotten evil has been brought back to the surface. The Caribbean was once tormented by a pirate who was so evil that people said he had surely made a pact with the Devil himself. Captain Remington stole untold treasures and had no qualms about murdering anyone unfortunate enough to get in his way. Even the foulest villain eventually meets his end, and justice eventually prevailed. This cruel man was cast into a watery grave, never to be seen again. Deep sea divers have uncovered the remains of a pirate at the ocean’s bottom. The corpse has been so well preserved that a local museum has decided to put the pirate on display. Ms. Sarah Black is the curator responsible for organizing the exhibit, and her young daughter has taken an interest in the pirate artifacts. When the pirate comes back to life and kidnaps Sarah’s daughter, it’s up to you to help save her from Captain Remington’s plot to bring the love of his life back to the world of the living. Can you save the daughter before her essential life force is stolen? It will take bravery and wits to foil the Caribbean’s most nefarious pirate! The museum is a fascinating place full of exotic and unique objects. Step into the shoes of the museum’s curator and enjoy free reign over the museum’s many ancient artifacts. Exploring the area is easy thanks to the interactive cursor. This cursor will change when it’s possible to interact with an object. Explore rooms by moving the cursor all around the screen, and be on the lookout for hidden secrets. If the cursor turns into a hand, it’s possible to pick up an object. Collect useful items for future use. Regular and expert modes make this game great for all skill levels. In regular mode, misclick penalties are suspended and active zones glimmer and shimmer. Hint and skip options are also readily available for help when you need it. Active locations are indicated on the map. In expert mode, misclick penalties are applied in full force, and the hint and skip options take much longer to recharge. Active zones do not glitter and they blend in with the background, requiring expert sleuthing. Active locations are not indicated on the map. You may toggle through difficulties at will during the gameplay by visiting the selection menu, giving you full control over your gameplay experience. 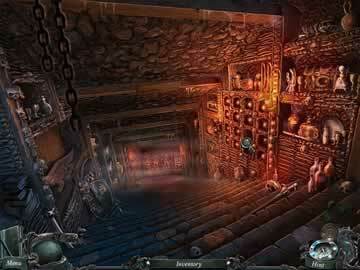 The hidden object scenes in this game are well crafted and will thrill any fan of hidden object scene puzzles. However, if hidden object puzzles aren't your speed, the game offers you the opportunity to play a pirate themed mahjong minigame instead. Sonar also is available for those times when you just can’t find one of the objects. Sonar will illuminate the silhouette of the object, making it easier to find. 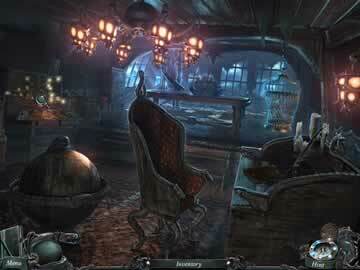 In addition to the fantastic hidden object puzzles, this game also features tons of situational puzzles that require logic and thought to solve. There is never a dull moment with this game! The setting and sound in this game creates a creepy, dreary atmosphere that will chill you to the bone. A ghostly radio in the office plays eerie sounds and music, and unknown creatures make things go bump in the night. Thrills and chills await around each dark corner. Overall, this game is a solid puzzle title that delivers an immersive and satisfying gameplay experience. This game is highly recommended for hidden object and puzzle fans of all skill levels. Yo ho, me hearties. Adventure awaits!